Essays on Numerology and the Tarot ACES What I believe about the Aces is that they require consciousness. In other words, especially in the context of a reading, they are not just raw powers, unfertilized seeds, hidden gifts. The Aces represent the point of conception and conceptualization. Their number is one, which represents consciousness of self – “I am”, and is related to the conscious mind of the Magician. They represent the point at which an idea, thought, feeling, gift, or energy becomes known in our lives. It is not yet acted upon, manifested, or maybe even thought about, but it identifies itself and its potential. Here are some examples from life, that I associate with Aces: Wands: the moment of conception (for a man), the moment you realize what direction you want your career to take, the flash of inspiration that eventually gives rise to a creative work of art or writing, a moment of personal revelation about yourself and your life, the moment when you realize that you need to a take a life-altering course of action. Cups: a rush of unexpected emotion that wakes you up to something you’re subconsciously feeling, the moment you realize who your life partner may be, a gift of a something beautiful or aesthetic that brings peace or calm, a spiritual vision, a creative inspiration, also the moment of conception (for a woman). Swords: the first idea or emergent concept that gives rise to a line of philosophical inquiry or research, a flash of insight into how to solve a problem, any “first thought” that leads you in a new direction, the moment when the pieces of the puzzle suddenly click together. Pentacles: conceptualization in the mind’s eye of a thing or creation – a visualization of a garden, woodworking project, house, or anything you create with your own hands. A moment when you realize you can build or create something tangible, such as your own business, or writing a novel. The day you decide you want to own a home or have a family. A sudden gift of funds that changes your life – a grant, scholarship, inheritance – or even the idea to seek such funds and what you want to do with them. The moment when you first realize you want to change something about your body, health, or physical surroundings. What these all have in common is *consciousness* of an emergent idea – a seed yes, but visible, germinated, and ready to put down roots (the twos) and then flower (the threes). Almost by definition, the minute you turn over an Ace in a tarot reading, the client will become conscious (if they are not already) of the potential of that energy to manifest in their life. This is the moment when some elemental power in the Universe manifests itself in a *particular form* in your life and says “I am” or perhaps “I can be if you will it so”. TWOS The Aces represent a generative energy that identifies the potential for some new opportunity in our lives. The Aces are associated with the Magician, conscious thought, and masculine energy. In the Twos, we find the next step in manifestation of this new idea. The Twos are associated with the High Priestess, and represent a reflective, thoughtful, feminine energy stage. Here we take our new idea and we ponder it, plan for it, start the preparations, and begin weighing the possibilities. Choice between two alternatives is a key aspect of the Twos – to keep what we have or try for something new – to evaluate our new idea and decide whether to actually do it or not. Here we must look at our new idea, lover, emotion, etc., and make a choice about committing to it or setting it aside and waiting for the next possibility to arise. In the Twos, there is interaction with others – the self vs. the not-self – and decisions to be made that have long-term implications. Here are some real-life examples of the Twos: Swords: The first time we take our new idea and tell it to someone else. We perceive their reaction (good or bad). We try to decide if it really is a good idea and should be acted upon, or just a wild imagining. We do some research to see whether others have already had this idea and what they thought about it. We hold actual activity in abeyance until we have thought our idea through some more and decide whether to pursue it. Cups: Our rush of feeling for someone else has turned into a real relationship. This is the stage where we get to know each other closely, and decide whether or not to commit to this relationship over the long-term. We learn each others good points and bad points, compatibilities and incompatibilities, and as yet have not made any decisions, just enjoying the ride. In the meantime, we begin to think about what a future with this person might be like, even if we have not yet spoken of it. Wands: We are considering starting a new life. We have something stable already built, but are considering leaving it and heading out into a new direction, to become a new person. We are weighing the risks against the potential gain of expansion of our horizons, but have not yet left the security of our homes. This could be an adolescent considering moving out of his parent’s home, a person deciding whether or not to leave their marriage, or a businesswoman considering moving to a new country to take a new job. At this time, all the considerations are weighed and any planning or preparation is done that is needed. Disks: Here we are faced with a physical or material decision that has emotional undertones. We are keeping our options open by juggling more things than we can really handle over the long-term. Meanwhile we struggle with the internal process of deciding which of these things to keep and which to let go. A new opportunity (Ace) has entered our life, but to take advantage of it, other things must be dropped. An example might be working long hours to build a consulting business while still holding a full-time job, knowing that eventually either the consulting business will take off and you can quit your job, or it will fail and you will go back to your first job without the extra hours of work. Here we try to determine if this new financial or material opportunity is really viable and worthy of our full attention and investment. THREES The Threes can be associated with the Empress, and are the productive and fertile union of the pure male principle (embodied in the Magician) and the pure female principle (embodied in the High Priestess), and are considered balanced and harmonious for this reason (all the multiples of three are). The Threes therefore represent the traditional associations of fertility and abundance, but also the first earthly manifestation of the new gift or potential that came with the Aces, which has been pondered, planned for, evaluated, and decided upon in the Twos. Even at this point, the journey is by no means finished. In fact, it is just getting started – but the first actual steps toward making it a reality have been taken. Another aspect of the Threes is the intervention or involvement of three people. Just as the Twos deal with duality, which often involves another person, so the Threes take this one step further – leading to even greater productivity or greater difficulty, joy or pain. Here are some card associations corresponding to these aspects of the Threes: Pentacles: The first actual use of a newly learned skill to make something. A project moves from blueprints to construction. A family moves into its new home after deciding to move across the country and start a new life. A financial investment pays off with dividends. Working in teams to accomplish something practical. Cups: Friends or family celebrate a commitment to a relationship, such as a betrothal – this is the stage when the relationship has been publicly announced and celebrated, but the marriage has not yet taken place. A pregnancy or adoption. The first harvest of the season, celebration and sharing these fruits with others. Swords: The moment that a new direction of thought is manifested, for example, a person writes the first chapter of a new book. A grant is received and a scientific research program begun. A person presents their ideas at a conference and gets public or professional feedback and criticism. The intervention of a third party into a previously stable relationship, resulting in jealousy or heartbreak. Wands: After long planning, a person starts a new business and gets their first contract. A person makes a decision to change their lifestyle and begins to take the actions required to achieve this change. A person takes their first independent steps out into the world and goes exploring. A new job offer is accepted that reflects a change of career. The expansion of a business to include employees or a new partner. All of these situations lead to growth, sometimes painful, sometimes joyful. FOURS Fours are identified with consolidation, security, stability, building foundations for the future, resting, and regeenerating. Just as the Three are expansive and creative, the Fours represent consolidation, contraction, and conservation of energy. They are the natural counterbalancing force to the Threes, and a restful stop before continuing on to the unstable energy of the Fives. We can liken the first four numbers to the seasons of the year. Aces are springtime – the germination of the seed, the first shoots of the plants, the thawing and beginning of a new cycle. Twos are summer – putting down roots and sending up stems and leaves – the potential of the plant beginning to be realized. Threes are autumn – the fruiting, ripening, and harvest of the plant and celebration of the harvest. And Fours are winter – resting, conserving energy, established plants putting down deeper roots during dormancy, preparing for the next cycle. Here are some real-life examples of fours: Swords: Restful contemplation after a painful experience which has expanded our understanding of ourselves, others, or the world. Time is needed to heal our mental wounds and to integrate what we have learned in a positive manner. During this time, we try to fit what we have experienced into a mental framework and make sense of it. This could be a solitary vacation or retreat to try to sort out your direction in life, rehabilitation after surgery, a mental illness or drug addiction, or as simple as taking some time off after completion of a particularly demanding or difficult project at work. Wands: In this card there is celebration, but also a formalization of a business or romantic relationship into a partnership that lays the foundations for the future. Here we are making a final commitment and agreeing to live by certain promises, rules, or ethical standards freely given to one another, that will set some limits on future activities but also provide a solid and stable foundation for growth together with our chosen partner. A marriage or formation of a business partnership are good examples. Cups: Here we begin to see that all is not love and perfection in our relationships with others. We have gotten past the breathless excitement, romance, and passion of our early relationships, and reality and familiarity is setting in. This is a test of our ability to see things as they really are, to establish a deeper relationship with someone that is not based on transient pleasures. Or else, we may discover that there is nothing really solid there and we are bored. This could be likened to a mid-life or mid-marriage crisis. If a couple gets through this stage together, then their marriage nearly always comes out the better or stronger for it. Or, they may do something they bitterly regret later (5 of cups). Disks: This card represents consolidation of our finances or material possessions. In a positive light, after the expansion and risk-taking of the Threes, we pull back a bit and make sure we are providing for our future. We may focus on building our assets carefully, rather than investing in dot.coms. We establish bank accounts for our kids’ future college expenses and for retirement. We protect our investments through insurance and careful money management, and put a hold on any risky activities. We pay attention to our diet and exercise, trying to hold on to our youth and good health. FIVES Fives are an interesting dichotomy in tarot – in traditional decks they are painful, negative cards, and yet in some more modern and feminist decks they are cards of spirituality, magick, and womanhood. The same duality can be seen in their associated trump, the Hierophant. On the one hand, he represents in some decks and to some readers all that is wrong with organized religion – corruption, greed, and intolerance. On the other hand, he represents the link between the divine and the mundane, the Word of Spirit brought to earth. Some decks assign the Hierophant to the element of earth, in his association with Taurus. To other minds, he is best represented by Spirit rather than one of the four earthly elements. In traditional numerology, Fives represent instability and change. After the highly stable (and some might say rigid) Fours, a fair amount of destabilizing energy is needed to push oneself out of this stable or stagnant situation to allow further growth. One characteristic of the Fives is that the change is generally not voluntary or expected – therefore, it can be frightening and there may be a real or perceived lack of control over the situation and one’s reactions to it. Hence the traditional associations of the Fives in tarot with the most negative situations in life. The movement from the Fives to the more harmonious Sixes can be brought about through a personal or spiritual transformation or through the grace of God/dess – and this is where the other side of the Fives can be seen, even in the traditional decks. The number 5 is also associated with women, and with magick. These associations may have been frightening to some originally, and added to the negative associations with the Fives (as in the fifth sephiroth of the kabalah). However, some newer decks, such as Wheel of Change, have begun to celebrate these as positive associations. The symbol of the upward-pointing pentagram is one that often appears, as well as four elements or directions integrated into central white energy in a ritual circle. I have been playing with a Tree of Life that encompasses the scientific aspects of creation, as well as spirituality, and some of the ideas that are coming out relate to the trumps numbered 0-5 – they can be likened to the natural creation of the earth, as follows: 0 – The Fool – spirit, nothingness, the origin of the universe 1 – The Magician – air, coalescing of swirling gases and elements into matter and molecules 2 – The High Priestess – water, the formation of the earth’s oceans and atmospheres, the creation of the necessary conditions for life 3 – The Empress – earth, the abundance of plant and animal life that arose next 4 – The Emperor – fire, the spark of consciousness and self-awareness that arises in humans and organization of the humans into civilization and the arts of agriculture, trade, law, government 5 – The Hierophant – spirit, the reaching out of human civilization for something greater than itself, a return to our connection with the origin, but filtered through our perception of the material world Notice that the trumps 0-5 comprise the four elements, bracketed on either side by Spirit. The trumps 1-4 are known as the “heavenly and earthly parents”, and this is quite interesting in this context :-). Some real-life examples of the Fives: Wands: Intense competition at work or in the marketplace, a clash of wills while the argument is still going on and no-one is sure who will come out on top, internal conflict caused by uncertainty about one’s identity or a challenge to deeply held ideals, instability that threatens a marriage or business partnership, scattering of energies due to lack of focus. Swords: Being confronted with new ideas that feel threatening to the established order of things, rampant idealism overriding calm reason, facing a harsh reality, mental instability resulting in cruelty or victimization, verbal battles or contests, a period of revolutionary change. Pentacles: Financial instability, loss or sudden change of job or living situation, being physically out of balance or ill, facing a period of hardship, rejection or isolation, physical violence or accidents, stress. Cups: Loss of a relationship, coping with death or illness of a family member or friend, grieving, emotional instability (positive or negative), self-doubt, fluctuating self-esteem, creative change. SIXES After the instability and stress of the Fives, the Sixes bring a welcome feeling of success and having overcome difficulties and obstacles. After sorrows and travails, joys taste even sweeter, especially since we have worked hard to reach this point. Now we enter a time of relative stability, but unlike the rigid stability of the Fours, this is a stability in which there is flow and interaction. I think of the Sixes as being in harmony with the world around us, letting energy flow through, into, and out of us. Here we understand the rewards of giving and are open to the blessings as they return to us in equal measure. We are no longer rigidly afraid of change nor so unstable that we are out of control, but somewhere in the middle, and the light shines on us in this happy state. This centered existence is the pivot around which our soul turns, and having once experienced this, we can climb to even greater achievements. The Fives and the Sevens both have their challenges, but to me the difference is that Fives are often thrust on us when we are not prepared and are not willing to let go of the Fours. Sevens, on the other hand, are challenges we choose freely, that will lead us to greater maturity and mastery in the end. Without our successful and centered time in the Sixes, we would not be ready to take up the challenge of the Sevens. Indeed, the Sixes are so wonderful there may be many times when we wish to just stop at this point in the cycle and not move on :). We cannot really do this, but we can stop and rest for a while, and use this time to recharge, energize, and enjoy life. Real-life examples of the Sixes: Wands: getting that job you always wanted and finding that it’s a perfect match for your abilities, getting a promotion, receiving recognition for something you deserve and can feel good about, winning through skill or ability, achieving a goal, being a good role model. Swords: overcoming fears and looking ahead, seeing the light at the end of the tunnel, moving steadily toward a destination of your choice, having your plans in order and the means to carry them out, making good progress after a period of intense difficulty, enjoying the journey. Cups: being in harmony with a friend, sibling, or lover, finding a safe and relaxing place, enjoying simple everyday pleasures like gardening or walking, feeling protected, spending quality time with your children, being on vacation, feeling at peace, simplifying your life. Pentacles: feeling relaxed about your money, believing and experiencing that the universe will provide for you, feeling the pleasure of sharing your wealth with others, enjoying your possessions without being overly attached to them, being in good health. SEVENS One concept of Sevens centers around the idea of challenges, chosen by and for ourselves as part of our path toward personal mastery (the Eights). After the harmonious existence of the Sixes, if we are completely satisfied there, we might never choose to move above that level. Indeed, for many people who achieve success in life, however they choose to define it, they may stay happily in the Sixes and never think of looking beyond their good fortune and where their hard work has brought them. Others feel an urge, a tug to go beyond anything they have achieved so far and meet a personal challenge. In life from the Ones through the Sixes, we have been learning to live successfully in the world and reach a harmonious balance with it. From this point on, any further we go is a more personal journey. In the Sevens, we choose our next challenge to focus on. The concept of personal choice here is critical. In the Fives, we are faced with difficulties and challenges that were not of our own choosing and which we are forced to deal with in order to reach the Sixes. We are often unprepared for the Fives, clinging to the stability of the Fours and refusing to look ahead. In the Sixes, we are prepared and we can see. We have reached a point of maturity and capability that allows us to look ahead without fear to new horizons and challenges. If we think of the primary 7 card in the Major Arcana, we can clearly see this concept. Here the driver of the Chariot carries with him all the forces he learned to balance in the Sixes – positive/negative, the four elements, the 12 astrological signs, etc. He starts out with the tools he needs for success, and he chooses to leave his familiar city and go forth on a journey of self-adventure (one can think of the great heroes of Greek mythology and their quests). This is what the Sevens are about for me. If he succeeds, he will reach new levels of self-knowledge and mastery in the Eights (Strength) and Nines (Hermit). Some real-life examples of the Sevens: Wands: A challenge of personal identity or beliefs. Coming out of the closet. Deciding to live according to a personal philosophy that runs against the mainstream. Defending a doctoral thesis. Taking on a career that is not well-paid but is important to your belief structure. Working for change when outnumbered by the system. Quietly explaining to your Catholic family that you are a Pagan and you plan to read tarot cards for a living. 🙂 Swords: A challenge of ingenuity or ethics. Taking a calculated risk with a possible significant gain or loss. Thinking out of the box, coming up with a creative and unorthodox solution to a difficult problem. Taking a stand on ethical issues in the company or institution that you work for. Knowing when to walk away, even if it means taking a loss, and calmly and maturely making the best of what remains. Learning to make do with less in order to reach a longer-term goal. Cups: A challenge of values, emotions, dreams, or desires. Reaching a point in your life where you feel you can set your own goals and trying to work out what those should be. Questioning the values you were raised with and deciding for yourself what you believe in. Beginning to understand what drives your response to other people and your relationships, and learning how to choose positive life partners. Working through a childhood issue that has been blocking your progress in life. Giving up unproductive fantasies or dreams and replacing them with dreams and hopes that are realistic and achievable. Pentacles: A challenge of long-term planning and practicality. Setting long-term goals for your life and working steadily to achieve them. Learning to value incremental progress over instant gratification. Learning to have patience with yourself and others. Saving money for retirement, college fund, or other important purchase. Buying a home and remodeling it little by little. Planting a garden that will take 20 years to reach maturity, and taking enjoyment in each small change. Making a 5-year plan to get an important promotion at work. EIGHTS The tarot is grouped numerologically into three groups of three, plus the Ten, which is a transitional number. Each group culminates with a multiple of three – 3, 6, 9. The Eight is midway through the third group, starting with the Sevens and culminating with the Nines. Recapping a bit on the Sixes and Sevens – the Sixes are where we find our first real successes in life, and feel in harmony with ourselves, our relationships, and our environment – the pinnacle of the second group of three. In the Sevens, we set ourselves a higher challenge – we choose to work on some aspect of our self or a major project that will take us to a higher level. Unlike some of the earlier challenges we face in the numerological journey, the Sevens are consciously chosen. They represent a graduation or initiation and a step forward in determining our individuality and life purpose, similar to the concepts associated with the Chariot. The Eights represent the mastery and accomplishments for which we are aiming. Once we have defended our ideas, made mature choices about our values and relationships, evaluated our ethical boundaries and willingness to take risks, and established a long-term plan (all Sevens), we begin to see these steps create results. In the Eights, we have reached a position of strength and maturity. Eights are a doubling of the Fours, almost like building another story on top of a firm foundation – very stable and solid (hopefully not too much like a Tower!). At this point, we do not only live in the world, we begin to shape our environment and our reality to resemble our personal vision. The Eights can be associated with the Strength card in the Major Arcana. After passing the tests, breaking free and moving forward on sheer will alone (Chariot), we come to exist with a deep personal strength that arises from setting and meeting our own challenges, facing our fears and darker side, and becoming a master of ourselves. In the Eights, we are not resting on our laurels or enjoying the fruits of our accomplishments (that would be the Nines), but we are still actively engaged in the exciting project that we began in the Sevens. Right now our world revolves around what we are doing and we are reaching new heights and depths. We may be acknowledged as an expert or master by the outside world, or it may be entirely internal, but in the Eights, we know who we are and what we are doing. Some examples of the specific cards: Wands: Here we have successfully defended our ideas or concept and it is all coming together for us. The resources are flying in to do what we need to do, communication is building, activity is bustling to make happen what we believe in and have envisioned. Any minute now, these ideas will come down to earth and be materialized into something substantial that can be presented to others. Imagine a business-man putting together a deal that will create a new company or launch a new product, or perhaps an architect who sees her revolutionary design for a bridge or building rise into the skyline. An artist gathers musicians from all over the world and launches a successful album that crosses over into new markets. A woman joins the Peace Corps and finds a way to bring together resources that provide water to an impoverished African village. Pentacles: A person reaches a deep level of mastery in a particular talent or area. In this card, I see the master-craftsman, the woodworker, the musician. A talent honed by long practice, a deep love of the tools and materials with which he/she works, and a level of earned ability that goes beyond what they have been taught by others. Whether a brick-layer, a tailor or a senior engineer, this person is rock-solid in their ability and sense of self-worth and their identity strongly resonates with their hands and how they use them. They may teach, but more often serve as a quiet role model for others who learn by doing and apprenticing. Cups: A person, having decided what they truly value in the Sevens, begins to actually live their values and takes steps to change their life. Many things may have to be left behind and few taken, even friends and family on occasion, but the journey into self under the Moon of the subconscious is paramount. This is the person who walks the walk and talks the talk, and leaves behind hypocrisy or half-formed, equivocal values systems. Perhaps he gives up his automobile and heats his home solely on renewable energy sources. Perhaps she leaves behind a husband she no longer loves or shares values with and looks for new companions in life. Perhaps after many long years of soul-searching, a person changes their religion to one they truly believe in. After the change, the person lives much more comfortably in the world, without the constant pressure of a lifestyle that doesn’t match one’s beliefs. Swords: This is probably the hardest card to fit into the Eight concept, based on the picture alone. If the Sevens present an ethical or risk-based challenge to your ideas or attitudes, in the Eights we are struggling to throw off the last bit of doubt, hesitation, or obstacles. All of these are in our minds, and here at least all Eight Swords are within easy reach – not falling out of our hands as they were in the Sevens. The mastery in this card is in realizing that we can – it is mastery over our minds and self-doubts. We do have the mental tools to accomplish our objectives, they are gathered all around and are even relatively well-organized. We just need to believe in ourselves enough to see it. The minute we do this, we will be able to use our minds as we wish to, make the connections we have been searching for, solve problems, and generate new ideas. The Eight of Swords once the obstacles are passed represents the senior scientist who runs his lab with confidence that new discoveries will be made each year, the author who now has several books published and can feel secure that she really has a career in writing, or the free-lance consultant who no longer needs to advertise because his talents are well-known in his field and doesn’t lack for business. NINES After setting a new challenge for ourselves in the Sevens, and rising to meet it with maturity and skill in the Eights, the Nines represent completion of this 3-card triad, as well as the entire 1-9 numerological cycle (tens don’t count in numerology – they are considered ones). As such, the Nines are associated with culmination, completion, finalization, wrapping up, winding down, enjoying the fruits of our labors, and reflection on our accomplishments. Being 3 x 3, the third cycle of three, they also represent the abundance and contentment that results from successfully reaching the end of a complete cycle. Alternatively, the cycle may have been a negative one, if things haven’t worked out as we planned. Always, they represent an abundance and the final culmination of whatever we have reaped or created during the cycle – good or bad, loving or angry, joyful or sad. Some ideas on how these concepts relate to the Nines: Pentacles: Retirement, enjoyment of one’s hard-earned possessions, living in the surroundings one has chosen for oneself, being a self-made person, a mature and beautiful garden but with no room to plant new things, the completion of a major project, financial reward for one’s efforts. Cups: Enjoyment of pleasures after a long day’s work, taking a well-deserved vacation or retirement, basking in the enjoyment of having completed all tasks and having no more responsibilities at the moment, a sense of contentment and fulfillment from finishing a creative project, celebration of an accomplishment, a return to childlike enjoyment of life in old age. Wands: Protection of accumulated resources, defending one’s position at the top but being a little past one’s prime, receiving recognition for lifelong career achievements, having a well-developed sense of self-identity and ego, being president of a company or having nowhere higher to go in one’s chosen field. Swords: Completion of an important thought process, publication of a major work, conscious realization of an issue that has been hidden or buried in the subconscious, the point at which a final decision is made and action must be taken, overwhelming thoughts that effect a transformation in the psyche, the culmination of a long and gradual shift in attitudes or beliefs. TENS Tens are the transitional number, the end of one cycle and the beginning of the next. Numerologically, tens are not stand-alone numbers, but reduce to 1 (1+0=1). In association with the Trumps, 10 corresponds to the Wheel of Fortune, which is also all about cycles, endings, and new beginnings. However, the number 10 can be looked at in many other ways – associated with Capricorn, it could be considered a number of great responsibility and solidity – like 4+4+2 – a two-storied tower with a peaked roof (now our Tower is complete – ready to be struck down and rebuilt). 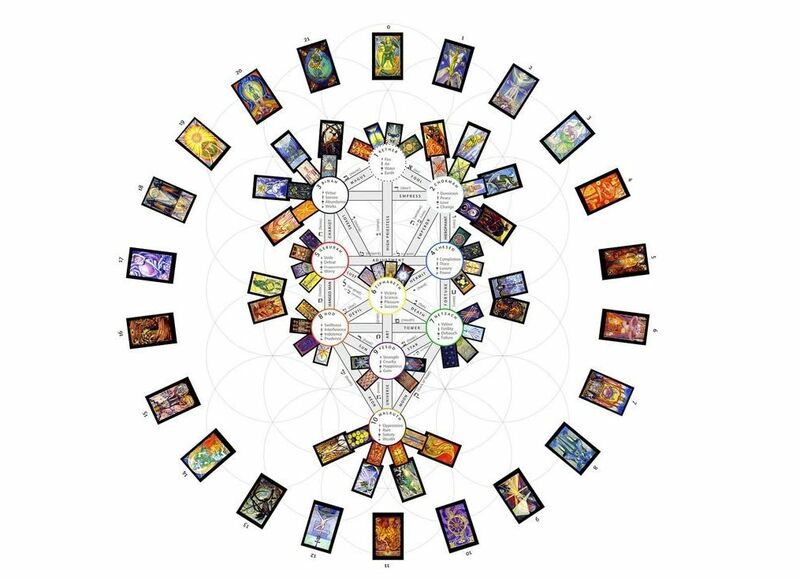 Associated with Malkuth on the Tree of Life, it is the number of manifestation, the only number that corresponds to the material world in which we experience our lifetimes – in this association, it is thought of as 3+3+3+1 – the one sphere in the realm of Earth. 10 is a magickal number, produced by the addition of the first four numbers, 1+2+3+4, important in Pythagorean and alchemical philosophy. With all this, what does the number 10 really mean? We can see in it elements of solidity and stability, as well as transition and change. These apparent contradictions are key to the 10s – in the Wheel of Fortune, we have the stable hub and the unchanging elements, as well as a continuous cycle of change around the rim. In the material world, we also have a central core that remains as we cycle through many lifetimes or cycles within a lifetime. The material world we build remains even as we ourselves are transitory through it. The 10s are about how we experience these transitions, what we take with us as well as what we leave behind, what we have built and what we allow to dissolve into the sands of time. It is interesting that the passive suits depict more positive transitions, while the active suits show more difficult transitions – this may have to do with the issues of control and resistance to the turning of the Wheel. Here are some examples of the Tens: Cups: The card of happy endings, yet in real life we don’t live happily ever after, unchanging. A moment of supreme happiness, when all that we have wished for is manifested. We cannot remain long here, because emotions and the water element are fluid and ever-changing. In order to keep this relationship alive, we must look for new sources of inspiration and emotion. This card may also represent the completion of an artistic endeavor – the moment when we frame the canvass and put it on the wall unchanging, only to be gazed at from now on. We ourselves must move on to the next project or risk stagnation and living in suspension. Pentacles: Here we see 10s in their natural element of Earth, representing all that we build in the material world and pass down from generation to generation. This may be the next generation of parents and children in the family, it can be material possessions such as homes or inheritance, cultural knowledge and traditions, or what we leave behind in our work to society to be built on by others. This card represents the time when we pass on what we have held to the next person or generation to hold and use it. While we pass on, what we have created endures and makes up the fabric of family and society. Wands: Wands are integrally associated with our self, our ego, our ideas, and our career. Because we initiate Wands cycles, it is that much harder to let go of them when the time comes – so we carry them around as a burden, unable to see that it is time to release them and go on to the next idea. Giving them up is bittersweet – both a welcome release and a regret. This may represent the moment when a CEO passes the company he built onto his successor and goes into retirement, or when a woman realizes she can no longer personally run every aspect of the department she has built from scratch, or when a family member realizes she does not have to take responsibility for solving everyone else’s problems and she can just live her own life. A person’s ego and self-identity may be quite wrapped up in the previous cycle, and he has to make the transition to investing in a new cycle before the burdens can be willingly laid down. Swords: A transition relating to ideas and attitudes, often more difficult or painful than others. Ideas, habits, and attitudes have a way of getting very strong hold of us and our minds, and when it comes time that it is necessary for a change to occur, it can be very difficult. We may struggle and struggle through the 8s and 9s before we are willing to do whatever is necessary to make the change, and even then, we may have to beat the old attitudes down hard before they finally lie down and give up the ghost. Or, it may come in a rush of surrender to the inevitable, giving ourselves up to the pain in a cathartic release that frees us to experience new ideas and ways of living our life. 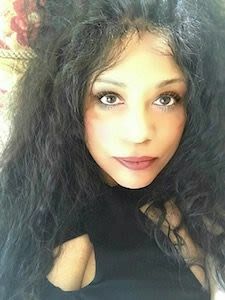 Teresa Michelsen is a tarot reader, author, and teacher with more than 25 years of experience reading tarot. She is well-known on tarot e-mail discussion lists, and has published many articles on tarot on the worldwide web. Teresa teaches on-line tarot courses for beginning and intermediate tarot readers, published her first book on Designing your Own Tarot Spreads in 2003, and published The Complete Tarot Reader in 2005. 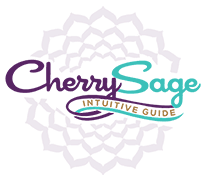 Her award-winning tarot website, www.tarotmoon.com, is a favorite destination of tarot readers who come for her lessons and articles on tarot, her examples of completed tarot readings, and beautifully laid-out pages on tarot cards and readings. Teresa lives near Tacoma, Washington, and in addition to her tarot work, has home-based businesses in environmental consulting and mediation.